Like its evil twin of Nazism, communism is an utterly despicable ideology that explicitly elevates the state over the individual. That’s actually the nicest thing that can be said about this barbaric system. If you want to begin to understand the human cost of communism, watch this short Reason TV video featuring Lee Edwards. Sometimes, it’s helpful to mock this disgusting philosophy with humor, as Reagan did so effectively (see the fourth video at this link and the first video at this link). Or we can use jokes like this doctored image. And we can point out that communism is so inefficient that you wind up with rationing of everything from food to toilet paper. But let’s not forget that communism isn’t just a sad page from history. Some people are still suffering under the yoke of Bolshevik tyranny. Here are some excerpts from a report in the Australian. North Korea has reduced the minimum height requirement for military conscripts because the current generation facing call-up was stunted by a deadly 1990s famine, a new report says. …the military has cut the minimum height to 142 centimetres from 145 cm. All able-bodied North Korean males aged 16-17 must begin mandatory service that lasts about a decade. Women deemed fit must also serve for a shorter period in the 1.2 million-strong military, the world’s fourth largest. 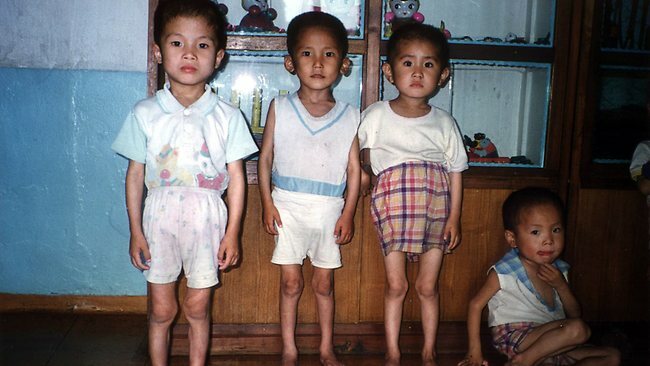 …North Korean boys facing conscription this year were born in the mid-1990s – at the height of the famine that devastated the impoverished communist state and killed hundreds of thousands. …UN agencies, after a visit to the North, estimated last November that three million people would need food aid in 2012. UN humanitarian chief Valerie Amos, after a separate visit last October, said that in northern regions almost one in two children were chronically malnourished. The passages above illustrate evil on so many levels, including famine and militarization. Imagine how awful it would be to be trapped in a sinister place like North Korea. This is why I am so quick to attack institutions, ranging from the Baltimore Symphony Orchestra to Mercedes-Benz, that demonstrate moral blindness to the evils of communism. By the way, even though I freely admit it’s unfair, I can’t resist adding this link revealing who the head of the Communist Party has endorsed for 2012.